1992 was a pretty momentous year for me. I moved to Portland in May…right about the time the Portland Trailblazers were making an run alll the way to the NBA finals (where they lost to the #$%#$%$ Bulls). I remember sitting in Huber’s having a Spanish Coffee with friends when Jerome Kersey walked in the bar and the electric vibe in the place was palpable. 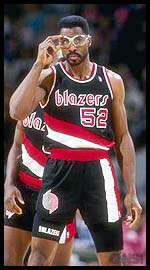 The Blazers were the Lords of the Willamette in 1992 and as popular as they are today, BlazerMania still isn’t what it was back in the pre-Rose Garden era. I was also present when candidate Bill Clinton spoke in Pioneer Courthouse Square (didn’t actually see him…having arrived late, I was hidden behind some columns). I witnessed the battle over Measure 9…likely the most contentious ballot measures ever placed before our voters. 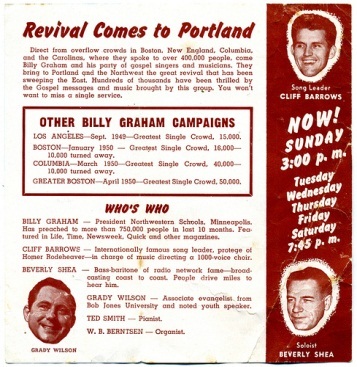 While I was familiarizing myself with my new hometown, I quickly noticed a plethora of blue Billy Graham Crusade bumper stickers placed on a rather large number of cars around Portland. I wasn’t in any way touched by the large scale buildup to the actual crusade…but eventually, the media started running lots of stories about it and as I started my job on the 1992 Portland United Way campaign at the ground level of the Mark O Hatifield Building, I realized the Crusade was going to run just 15 blocks up Burnside at Civic Stadium (now PGE Park). I’m the sort of person that always tries to attend “the big event” even if it didn’t fall within my normal sphere of interest. I tried to rustle up someone to go with me (since a religious crusade isn’t generally an event to go “stag”) and one of the other loaned executives that I really didn’t know that well at the time finally agreed to go. I remember asking him if he were Christian…he responded by giving me his personal spiritual beliefs which struck me as reasonably well thought out even if I totally didn’t understand a word of what he was trying to explain. So, we decided to walk up to Civic Stadium after work the day of the event. I believe the Crusade ran for 4 nights with different rosters of speakers each night. For me, one night clearly stood apart as the one to attend…the night that featured Johnny Cash & Trailblazer (then and now) Buck Williams. 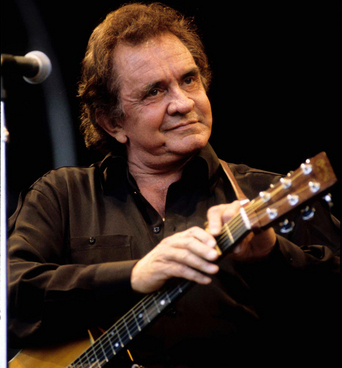 I was a huge fan of Johnny Cash when it wasn’t necessarily cool to be so…at the time, he was a couple years away from getting together with Rick Rubin for the first of the American Recordings series that cemented his iconic status. As for Buck, he was at his basketball peak playing for a team that just missed winning the NBA championship. Also, may I add that at my advanced age of 25, I had yet to sit through an organized church service...so I really attended the crusade with absolutely no preconceived notions on what to expect. We sat in the upper deck behind home plate…not the best seats in the house since the podium & choir were situated in deep center field. As we waited for the show to begin, I can remember a really peaceful vibe permeating through the place. My experience with Christianity at the time was limited small snippets of the obnoxious money-grubbing TV preachers and the weak souls that followed them. I wasn’t seeing any of that…this was the same crowd that I might have sat with at a movie or some other secular event. I don’t remember too much about the beginning of the event and I don’t believe anything Buck Williams said resonated with me. However, I remember quite clearly when Johnny Cash took the stage. He sang four songs (I believe June accompanied him on some of them). None of them were familiar to me, though when I recently viewed the documentary on the Portland Crusade, I determined that one was “Precious Memories”. Johnny spoke of his commitment to Billy & the Gospel…again, I don’t remember exactly what he said (besides that one of his kids had just moved here) but I certainly remember the presence he commanded and also that my ADD was kept nicely at bay as he spoke. There are many reasons why Johnny performed at Billy’s Crusades…he had star power & drawing power and was an unabashed believer in Christ, but as I reflect upon the event, I realize that Cash had a manner about him that commanded the audience to focus upon him with laser-like attention. Johnny was the perfect warm-up for Billy…he got you to open your mind to the possibilities of Christ…it was up to Billy to close the sale. The video of Billy’s entire sermon is present live on YouTube (in multiple parts) and it would be pointless to try to write out my memories when the whole thing can be watched online. Since I really had no experience in church, I was the ultimate “empty vessel” for Billy to fill up. And, he never once threw anything at me that would cause my internal defenses against the foreign nature of Christianity to engage. Billy spoke in the most mellifluous way and it was like everyone sitting in that packed stadium was sitting on his back porch drinking iced tea while listening to a wise old man. Clearly, the event that I attended pretty much on a lark (and to see Johnny Cash) had taken a very unexpected turn. I realized that I had generated some strong spiritual feelings…though without any such experiences to compare them to, at the time, I just didn’t know. Every person in their life has bellwether events that not only define themselves as humans but pave the way for subsequent growth that follows. I know now that being blessedly present at the Marvin Gaye National Anthem awakened me to the transcendent possibilities in my life and that my Blind Date with Marvin’s Anthem laid the mental groundwork for being able to assimilate Graham’s message at its necessary high level of consciousness (which ultimately made Marvin’s contribution to my spiritual life more omnipotent than Billy’s). Billy set a wonderful example of the “Possible Christian”…once whose fervent beliefs and good deeds were extricably tied together…an example that unfortunately all too few people who call themselves Christian follow. 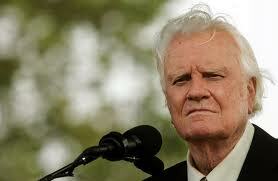 And yet, when Billy called people down to accept Christ as their savior, I didn’t go. Why? Several reasons. Clearly, I didn’t know Christ and I wasn’t going to take such a significant spiritual step when the only Bible Verse I could quote was tattooed on Robert DeNiro’s back in “Cape Fear”. Also, my friend didn’t go (and talking to him recently, he too sees the tremendous significance of his attendance far more clearly now than he did then). But, being someone who is inherently resistant to any sort of group psychology (I’m guessing 1/3 of the people in attendance received Christ that day), I have to confess that my inclination was to join the flock of people walking to the rostrum, even though I now believe that my choice not to was actually divinely inspired since I couldn’t perceive or appreciate the significance of the act. When Billy opened me up to Christ, he ultimately had the (perhaps) unfortunate side effect of poisoning any future attempts to affiliate myself with a church. I attend church services with my Christian wife Danika from time to time and invariably my mind wanders…I think about search engines, music or Twitter, and if I had the guts, I’d likely be playing on my smartphone. Why? The ministers, while certainly sincere, come across to me as pale imitations of what a religious leader should be. The worst ones have you “take notes” on the sermon…as if the spirit can be learned like a vocabulary lesson as opposed to being felt. You see, it’s a pretty universal notion that one really never forgets and gets over their first kiss, their first love, their first f***. It creates an indelible point of comparison future reference and no matter what transpires later in your life and how much better the present is than the past, there will always be that little voice in your head making that past / present assessment. I can’t get past the fact that I lost my “Christian Virginity” to Billy Graham and nothing I have experienced since can capture that level of spiritual fulfillment. Portland’s Luis Palau is the only other minister that I can say has reached me in some way…but his style is so divergent from Billy’s, it’s still not close. After the Crusades, my friend and I walked up to the McMenamin’s Blue Moon Tavern in Northwest Portland. Despite the relatively few blocks in distance from Civic Stadium, I can say pretty safely that he and I were the only folks from the Crusades to show up there after the event. 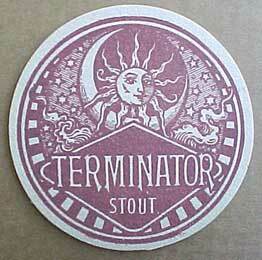 We split a pitcher of Terminator Stout. He and I have been excellent friends for 18 years now.